Cash-strapped states are scouting for ways to pay for critical road work, and increasingly, the result for motorists is the same: You're going to have to pay a toll. In the past, state and federal gas taxes largely covered the cost of building and maintaining roads. But the federal gas tax, currently 18.4 cents per gallon, has not changed in 20 years. Meanwhile, people are driving less and vehicles are becoming more fuel efficient. Nobody likes to pay tolls, but raising the gas tax is even less popular — and a tax hike would be an uphill battle at a time when Congress can't seem to agree on anything, said Patrick Sabol, an infrastructure analyst with the Brookings Metropolitan Policy Program. At least with tolls, Sabol said, people feel they are paying directly for roads they travel, instead of paying taxes to build and maintain roads they may never use. "There's a fairness argument," added Leonard Gilroy, director of government relations at the Reason Foundation, a libertarian think tank in Los Angeles. "If you use the roadway, you pay. If you don't, you don't." constant maintenance and at some point, they just need to be rebuilt, Gilroy said. "People believe that because they poured asphalt into the ground, they've paid for it, and that is never true. A road is never, ever paid for," Gilroy said. "What tolling does is take the hidden costs and make them transparent." According to the National Conference of State Legislatures, 42 states and the District of Columbia now have some sort of tolling authority or facility. Democratic Gov. Patrick Quinn of Illinois recently won planning committee approval for a $1.3 billion toll road linking interstates in Illinois and Indiana. Peter Samuel, founder of the newsletter Toll Roads News, said tolling is growing around Houston and Dallas. In Washington state, where tolling used to be limited to one bridge, there are now toll lanes. Many states with toll roads are raising rates. Major highway projects "are hard to do under your typical system today," Gilroy said. "With tolling, you are literally able to begin that project today instead of waiting years or even decades to do it. It's a good way to catch up on the unmet needs you have today." The federal fuel taxes motorists pay are funneled into the Highway Trust Fund, which is used to pay for road construction, maintenance and mass transit. The problem is that people are hitting the road less. A recent University of Michigan study showed that Americans drove 5 percent fewer miles in 2011 than in 2006. The increasing fuel efficiency of vehicles also has deprived the Highway Trust Fund of much-needed cash. The trend is likely to continue, as the EPA has set a 54.5 miles-per-gallon average fuel standard by 2025 for the nation's auto fleet. States are experimenting with various tolling approaches, including public-private financing and alternative ways of assessing tolls. Partnering with private companies to build new toll roads is popular because it spares state and local governments from taking on public debt. Details differ depending on the agreement, but they all involve having a private entity assume such tasks as building, operating and maintaining the roads for some kind of cash return, often tolling revenues. The government entity keeps ownership of the road. The advantage for states is that they don't have to float an unpopular public bond issue, and may even get an upfront payment from the private company. They also don't have to worry about collecting enough in tolls to cover the debt servicing or maintenance. Public-private partnerships are becoming more popular, according to the NCSL's Jaime Rall. Thirty-three states have authorized such agreements, up from 29 in 2010, and at least 24 states have considered legislation that would create a public-private road partnership this year, twice the 2008 figure, Rall said. But the projects haven't always been financially successful. 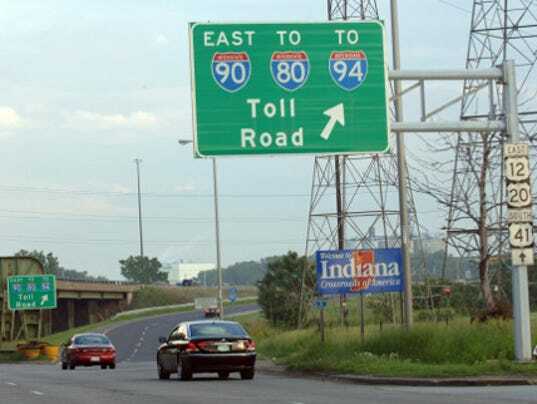 The Indiana Toll Road, for example, has produced weak revenues, leading to worries that the project may go into default early next year. If that happens, Indiana, which received $3.8 billion to lease the project, might team with a different private company or take over the road itself. A tolled portion of State Highway 130 in central Texas is having similar troubles. California's largest government toll road agency, the Foothill-Eastern Transportation Corridor Agency, recently refinanced debt after disappointing toll revenues put pressure on the agency's bottom line. Cherian George, managing director of global infrastructure at Fitch Ratings, said such failures are not uncommon globally. In the U.S., however, the capital markets are deeper, providing more opportunity for financing, he said. up with alternatives to tolls and gas taxes. Oregon officials are experimenting with charging motorists based on the miles they travel, instead of the gallons of gas they purchase. Under its pilot program, Oregon tracks in-state mileage using GPS or an electronic odometer. Some question the fairness of charging a gas-guzzling SUV the same as a fuel-efficient hybrid, but "regardless of what propels the car or truck, it still needs the same pavement, the same lights and the same guardrails," said Tom Cooney, communications director for the Oregon Department of Transportation. Across the country, states also are installing express or HOT lanes that promise speedier rides for a premium. From I-495 in Virginia to I-10 and I-110 in Los Angeles County, drivers pay more (how much more depends on the speed of traffic) to travel at a guaranteed speedier pace. Tolls are collected electronically, so motorists are not slowed by tollbooths. Such projects are ideal for large metro areas where there isn't the money or space to build entirely new roads, experts say. "It's great for motorists, because they have a choice," Samuel said. Not all states are resigned to tolling. Connecticut abandoned the practice in 1985 after a tractor-trailer crashed into cars at a Stamford toll booth 30 years ago, killing seven people. But with gas tax revenues increasingly unreliable, policymakers there are talking about it, albeit cagily, said Jim Cameron, a member of the Connecticut Rail Commuter Council. "There's been no politician I've found who embraces the idea. But they're going to have to do something," Cameron said.